" "Except perhaps for Arnold Palmer,no golfer has ever been more beloved by the gallery". About The Babe- An Incredible Woman:(From Wikipedia) Mildred Ella Didrikson was the sixth of seven children born in the coastal oil city of Port Artur in southeastern Texas. Her mother, Hannah, and her father, Ole, were immigrants from Norway. Although her three eldest siblings were born in Norway, Babe and her three other siblings were born in Port Arthur. She later changed the spelling of her surname from Didriksen to Didrikson. She claimed to have acquired the nickname "Babe" (after Babe Ruth) upon hitting five home runs in a childhood baseball game, but in reality, her Norwegian mother had called her "Bebe" from the time she was a toddler. Though best known for her athletic gifts, Didrikson had many talents and was a competitor in even the most domestic of occupations: sewing. An excellent seamstress she made many of the clothes she wore including her golfing outfits. She attended Beaumont High School. Never a strong student, she was forced to repeat the eighth grade and was a year older than her classmates. She eventually dropped out without graduating after she moved to Dallas to play basketball. She was a singer and a harmonica player and recorded several songs on the Mercury Records label. Her biggest seller was "I Felt a Little Teardrop" with "Detour" on the flip side. Already famous as Babe Didrikson, she married George Zaharias (1908–1984), a professional wrestler. Thereafter, she was largely known as Babe Didrikson Zaharias or Babe Zaharias. The couple met while playing golf. Didrikson gained world fame in track and field and All-American status in basketball. She played organized baseball and softball and was an expert diver, roller-skater, and bowler. She won two gold medals and one silver medal for track and field in the 1932 Los Angeles Olympics. 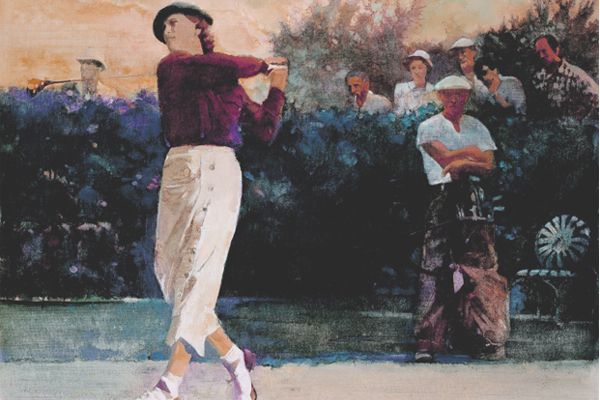 By 1935, she began to play golf, a latecomer to the sport in which she became the most famous. Shortly thereafter, she was denied amateur status, and so, in January 1938, she competed in the Los Angeles Open, a men's PGA tournament, a feat no other woman tried untill Anika Sorrenstam, Suzy Whaley and Michelle Wie almost six decades later. She shot 81 and 84, and she missed the cut. In the tournament, she was teamed with George Zaharias. They were married eleven months later, and lived in Tampa, Florida on the premises of a golf course that they purchased in 1951. She went on to become America's first female golf celebrity and the leading player of the 1940s and early 1950s. If she had wanted to gain back her amateur status, she would have had to play no other sports for three years. After gaining back her amateur status in 1942, she won the 1946 U.S. Women’s Amateur and the 1947 British Ladies – the first American to do so – and three Women’s Western Opens. Having formally turned professional in 1947, she dominated the Women's Professional Golf Association and later the LPGA, of which she was a founding member. Serious illness ended her career in the mid-1950s. Zaharias won a tournament named after her, the Babe Zaharias Open of Beaumont, Texas. She won the 1947 Titleholders Championship and the 1948 U.S. Women’s Open for her fourth and fifth major championships. She won 17 straight women's amateur victories, a feat never equaled by anyone. By 1950, she had won every golf title available. Totaling both her amateur and professional victories, Zaharias won a total of 82 golf tournaments. Charles McGrath of The New York Times wrote of Zaharias, "Except perhaps for Arnold Palmer, no golfer has ever been more beloved by the gallery". In 1948, she became the first woman to attempt to qualify for the U. S. Open, but her application was rejected by the USGA. They stated that the event was intended to be open to men only. Zaharias had her greatest year in 1950 when she completed the Grand Slam of the three women's majors of the day: the U.S. Open, the Titleholders Championship, and the Women's Western Open, a feat which made her the leader on the money list that year. Also that year, she reached 10 wins faster than any other LPGA golfer, doing so in one year and 20 days, a record that still stands as of 2012. She was the leading money-winner again in 1951, and in 1952 took another major with a Titleholders victory, but illness prevented her from playing a full schedule in 1952-53. This did not stop her from becoming the fastest player to reach 20 wins (two years and four months). Zaharias was diagnosed with colon cancer in 1953, and after undergoing surgery, she made a comeback in 1954. She took the Vare Trophy lowest scoring average, her only win of that trophy, and her 10th and final major with a U.S. Women's Open championship, one month after the surgery and while wearing colostomy bag. With this win, she became the second-oldest woman to win a major LPGA championship tournament. These wins made her the fastest player to reach 30 wins (five years and 22 days). In addition to continuing tournament play, she also served as the president of the LPGA from 1952 to 1955.